Proprietors Paul and Hannah Knoernschild, standing to the left of the horse and buggy, in the coal and clay mining town of Taylor. Taylor was a mining town located about 4 miles east of Hobart on a branch line of the Columbia & Puget Sound Railroad. The area was first homesteaded by Sam Galloway, who discovered both coal and clay deposits in 1892. Three years later the property was sold to Arthur Denny, who’d founded Seattle in 1852. He formed the Denny Clay Company, which opened the mines with the coal used to fire the clay manufactured into bricks, shingles, and sewer pipe. Over 633,000 tons of coal were mined and millions of clay products shipped. The town supported a sawmill and had a population near 1,000. Shown here is the Taylor store with proprietors, Paul and Hannah (Wilkenson) Knoernschild, standing to the left of the horse and buggy. Paul Knoernschild, the son of German immigrants, was born in Milwaukee before the turn of the century. He came west to visit a brother in the early 1900s, and somehow ended up working at the grocery store in Taylor. Hannah Wilkenson’s mother ran a boarding school in Taylor. The couple met and married in that small mining community. Eventually they moved to Issaquah where Paul continued his grocery work. 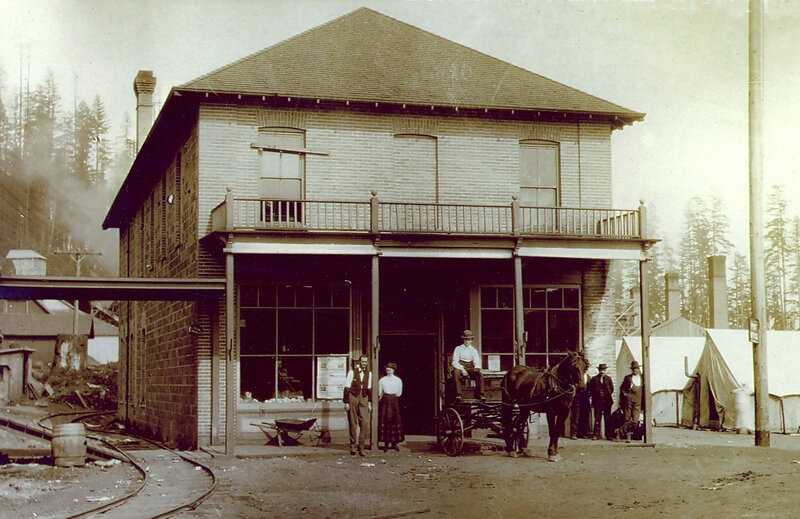 Knoernschild operated a store in the Odd Fellows Building on Front Street and later became the manager of the Issaquah Grange. He was civic-minded man, serving on the school board for several years. Research for this column was provided by JoAnne Matsumura of Issaquah. This photo #85.37.1 comes courtesy of the Maple Valley Historical Society. Can anyone tell me exactly where Kummer was? I think it was somewhere on the road to Flamming Geyser. My dad Bill Petchnick was born there. You’re right. Kummer was on the Green Valley Road, just off SR-169. The Kummer school building is still there, though not in its original location. Here is a now and then of the school. And here is a blog post. The only other building associated with the former town is a barn across the street from the school. Everything else is gone.